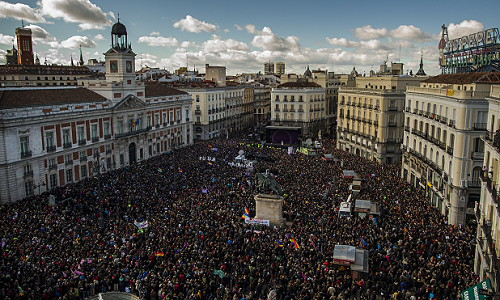 ▲ Supporters of “Podemos” are demonstrating a parade from Madrid City Hall to Puerta del Sol, Spain. The upcoming April 13th is the general election day in Korea. Voting is clearly the most basic way for citizens to exert their power in a democratic society, and at the same time it is a stepping stone for well-functioning democratic society. However, there are quite a lot of people who possess apathy or hatred towards politics in Korea, saying, “Neither will do a good job,” or “No one will listen to my demands.” This is not the only case in Korea. Europe has also struggled with the same dissatisfaction with politics, and has tried to find ways to solve its frustrations. Recently, several European countries have created online networks that allow citizens to freely talk about politics, aiming for direct democracy. Surprisingly, this new movement had a considerable impact on the countries’ politics and the situation has entered upon a new phase. A representative democracy aims an for efficient ruling by a sufficiently small number of people on behalf of the larger population. This form was the dominant form of democracy possible in the modern societies. On the other hand, direct democracy is a form of democracy in which people decide policy initiatives directly. This form was thought to be impossible because the modern society has become too large for direct democracy to function effectively. In spite of all the common notions about direct democracy, online networks are playing a key role in making direct democracy a reality. Various kinds of political networks have developed in Europe. “Madrid Decide” from Spain is a website for citizen participations, opened by Madrid Government. After a simple registration, anyone could suggest policies and legislation. When a suggestion receives agreement from more than two percent of voters in Madrid, it is put to the plebiscite. Proposals that are agreed on by more than half of the voters are developed into actual policy. “Loomio” is currently known as the biggest open network for sharing public opinions. The site seeks flexible communication on socio-political issues regardless of time and distance restrictions. Users go through a debate on a certain agenda, and make the final decision by voting. “Loomio” is presently used by 92 nations including Korea, with 75,000 registered users and more than 25,000 decisions are made since its beginnings. “Open Ministry” is a website from Finland, which extends legislative power to citizens. Legislative power was regarded as a sole discretion of the National Assembly, however, it was opened to the public through revising the constitution. Under the amendments, the Assembly will consider bill proposals or law revisions from citizens with electronic signatures from more than 1.7 percent of the population. “Open Ministry” made the process easier by assembling citizens both online and offline. In 2014, the Additional Punishment Law for Drunken Drivers, originally suggested by one citizen, was actually introduced in the National Assembly of Finland. There are several other cases where online networks that citizens have joined have actually affected the politics in reality. In May 2015, there was an election revolution in Spain. A new party called “Podemos,” created by citizens, won mayoral races in both Madrid and Barcelona. Citizens shared political opinions on “Loomio” and “Madrid Decide,” and began forming a public-based political network. The result was astonishing. Five of “Podemos” politicians became MEPs (Member of the European Parliament), with eight percent support in polls in just two months after the formation of the party. “MoVimento 5 Stelle,” started by Beppe Grillo in 2009 and now spreading throughout in Italy, is another successful political movement made by citizens. This online based party actively selected new politicians, and has rapidly become a major force affecting Italy’s political structure. As a result, in 2012, a politician from “MoVimento 5 Stelle” won a mayoral race in Parma, Italy. In 2013, the party achieved extraordinary success in national elections, accounting for 25 percent of lower house and 24 percent of upper house. Korea is also on the move towards creating online political media, with a number of initiatives which are just in the beginning stages. There are several networks that were recently created. Currently the biggest platform is called “WAGL (We All-Govern Lab),” a research and coordinating network that was launched in August, 2015. This network pursues bold and innovative experiments in media and politics, and change in political landscape by engaging more people in decision making processes through public discussions. There are also other platforms called, “Wing,” “Move Now,” and “New Party.” The goal of all these networks is to make people believe that politics is something that is very closely related to their lives rather than being some distant, difficult concept. Although efforts are being made, Korean citizens are relatively unaware of new kinds of online platforms. Joseph Kim, a project manager and co-founder of “WAGL” said that it is because people have not tried this form of movement ever. He said, “Korea has the highest information technology and smart phone distribution rate. It took me quite a long time to figure out why this had not been done before, and finally one thing came up to my mind. We did not know we could do it.” Kim emphasized that online political networks could reach success if all citizens try. In ancient Greece, the Agora served as a place for all sorts of discourse. However, in the modern society, places such agora cannot possibly exist. However, the continuing development of technology is showing the possibility for the new Agora. People who are indifferent to politics say that they have no time to think of anything but their own lives. At this point, where a new means is needed to solve the problem of indifference and apathy, online direct democracy could be a key. Korea has just begun with this movement, so it is actually up to the citizens whether they really want to develop our country’s democracy, by changing the structure to be centered to themselves.